Ranger - NEXTGEN™ RimGuard™ 33" Double Bead Roller Power Assist Changer - Gary Bloom Sales, Inc.
Ranger’s new R30XLT combines traditional swing arm tire changer elements with advanced power assist capabilities to service everything from standard steel wheels to challenging low-profile tires on large luxury wheels. • Improved electric motor features the best of proven technologies, including rugged copper rotor construction, stronger high-quality ball bearings, thermal-cool epoxy insulation, and durable rolled steel frames. All motors are 110-208/230V and 50-60 hertz capable. 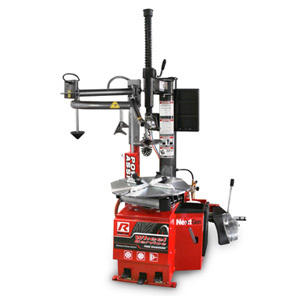 • A powerful bead press mounting system features powerful traveling bead roller, a quick-change lower disc roller and centering cone to aid in clamping, lubricating, demounting, mounting and inflation difficult tire and wheel combinations. • Stainless-steel and aluminum pneumatic cylinders are designed to reduce machine vibration and provide low-friction and long life operation. Internal end-of-stroke cushions are standard that help provide cushioning at the end of each full stroke to rescue wear on seals, wear band and piston rod. • A hardened alloy steel mount and demount head has a unique equidimensional shape with micro-smooth tool head surface that glides tire beads effortlessly during mounting and demounting procedures. • Quick-change tool head chuck provides infinite tool head axis positioning for pinpoint wheel edge tracking within a wide range of wheel diameters and tire and wheel combination minimizing tire damage and relaxing the strain on low profile tire beads. 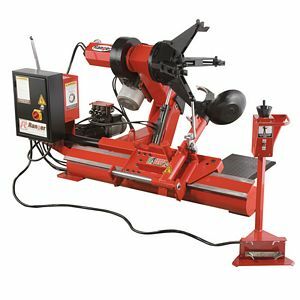 • A completely new and proprietary bead-breaker design features bilateral pneumatic accelerators for lightening fast bead-breaker speeds in both directions. A 100% stainless-steel cylinder body means no more worrying about moisture contamination from corrosion due to air source condensation. Other exclusive design features include a multi-axis, adjustable blade for multi-angle tire capacity, a large, dual-flange axle that eliminates blade flex and premature failure, and adjustable blade settings that help accommodate a larger variety of tire and wheel combinations. 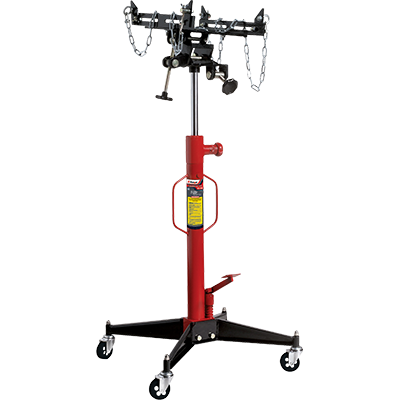 • Dual positioning adjustable RimGuard™ wheel clamps can accommodate wheels 10” up to 33” and feature internal and external multi-teeth jaws. • Durable forged steel (instead of cast iron) foot pedal levers will stand up to everyday use and abuse in high-volume tire centers. Snap action spring return means precise and controlled operation. 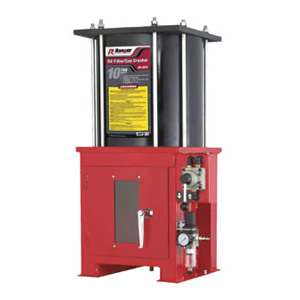 • Ranger Next Generation™ tire changers feature high pressure polyurethane pneumatic tubing with mirror smooth seamless bore for exceptional flow rates, high abrasion resistance, high burst tolerance and maximum kink resistance. 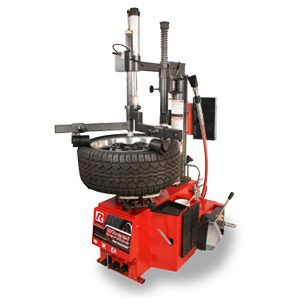 Ranger tire changers feature the renowned TurboBlast™ bead seating system* that blasts a powerful air burst between the tire and rim to help seat stubborn beads fast. A durable, non-marring nylon discharge barrel features a contoured tab that locks securely on the edge of the rim for better control during air discharge between the tire and wheel. A welded-steel, eight-gallon surge tank is larger than competitive models for all the inflation power you need, when you need it.